I've been writing since almost ten years ago, including almost six years hiatus in between. It's something I do that I really enjoy and probably will continue doing so. I will not lock any of my stories despite the plagiarism or translation issues, because I believe that once a story is posted online, it's not only yours anymore. My OTP changes with what fandom I'm in, but right now kpop, particularly Changmin x Junsu is my biggest and totally unhealthy obsession. Some of my older works are posted on Fanfiction.net so you might find some links to that site. For those who want to follow me, I have a Twitter account. I usually ramble about writing, work and life in general on myTwitter account. That one is also where I spazz about kpop (dbsk) mostly. These are NOT the order I'm working them on. Summary: Harry Potter!AU. 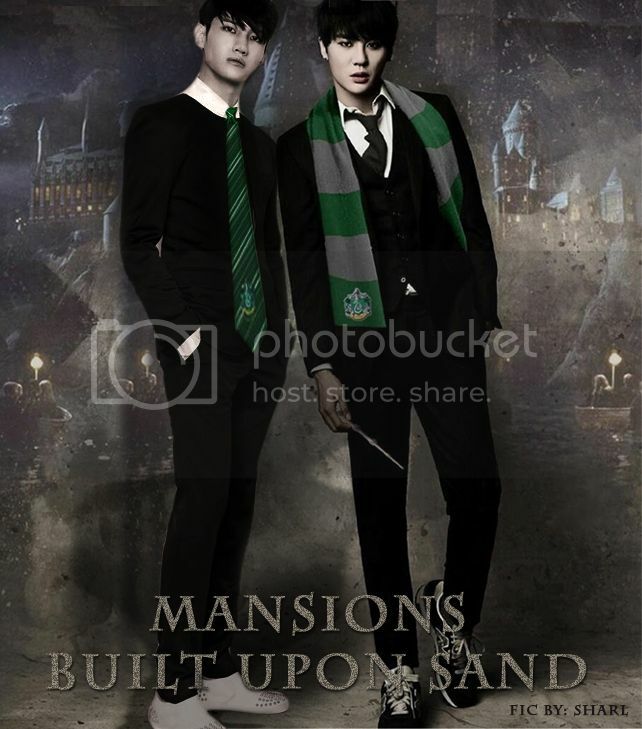 All Slytherin wore masks, Changmin and Junsu were no exception. One step outside their dungeon and the masks would be in place. Unbeta-ed. All mistakes are mine. Original Junsu fan-edit is not mine. Poster made by snowwball. Thank you dear! It's beyond gorgeous!! Thank you for all the prayers and donation that have been sent. My mother passed away about 6.5 hrs ago. She is in better place now. Disclaimer: Sadly, they are not mine. Summary:Once upon a time, in the land far far away, there was a wizard named Kyuhyun. So yesterday I got called by our commercial director (one step below GM). She's a high ranking person, and the one I fret about few months back, when I was supposed to do a presentation to her and a market visit together and I was so worried about that. And this once was no better. I got an email from her around 10am ish, she said she wanted to have quick catch up at 1pm. I was worried for the whole morning, because SHE'S A COMMERCIAL DIRECTOR DAMN IT. Seeee~ good things are bound to happen, even in the midst of difficulties. The most important thing is to stop whining, stop complaining, shut up and move on. Do small things often and they will open path for greater things. I don't know what I want to do, just like so many other people, but in the meantime, just keep doing what you're doing right now. Do what you love, or if the circumstancs don't allow you to, start loving what you do. P.S: I start writing again yesterday. P.P.S: I miss writing. Wish I can have Hermione's time turner and have infinite time. My mom currently is undergoing a surgery, a minor one, her hip joint surgery's wound was infected. Hopefully she'll recover soon. It's been too long. She's been hospitalized since July 12th and has spent the last month in the ICU. I haven't been writing much lately (apologize) and this morning I opened my Dropbox fic and stared ghastly by how long it has been since I last wrote! Tried to type few words at work, but that's that. Quite an unsuccessful effort I must say. I'll try to fit as many writing time as possible. With a new boss, hopefully he'll be able to filter the pressure and gives us room to breathe, so to speak. Meanwhile, take care of yourselves people! Eat well, get enough rest, say loving words to people that you love. Be grateful of what you have, think positive thoughts. Listen to the songs that makes you feel good. Smile a lot. P.P.S: No matter how horrible you think your condition is, there is always someone whose condition is worse. P.P.P.S: Stop complaining. Stop whining. Shut up and move on! Summary: But sometimes we learn something new about the past that changes everything about the present. Unbeta-ed, all mistakes are mine.